The great thing about conventions is everyone has their own experience. 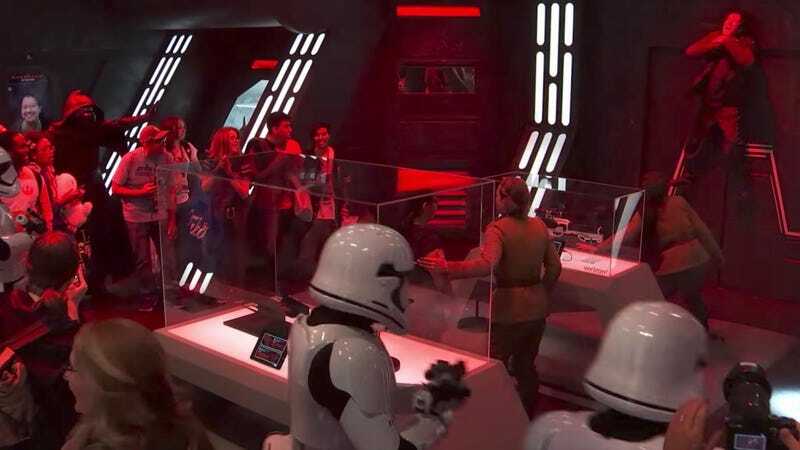 For example, io9 did a tour of the Star Wars booth at New York Comic Con and certainly thought it was cool. But later in the weekend, some unsuspecting attendees got a much, much different experience. The official Star Wars YouTube just posted a video of a stunt that was pulled off at the booth. But it wasn’t just your usual convention “stunt.” It involved actual, impressive “stunt work,” especially considering it was on the convention floor of the Jacob Javits Center among tens of thousands of people. Check it out. I mean, that’s pretty great. And it would have been great even if they did the spy thing for booth attendees and raided the space with Stormtroopers. But for Kylo Ren to come out and force throw a Resistance fighter up the wall? That’s just wonderful. Did any of you actually see this in person?